Let's visit the home of a creative entrepreneur who is also a world traveler. She definitely has diverse tastes in furniture and accessory cultivated from visits to exotic locales like Bali, Thailand, Japan, India, Kenya, and China. I love these fluorite crystals displayed on an acrylic stand. Her dramatic slab dining table was sourced in Mas, a woodcarving village in Bali. The raw-edge slab is made from Suar Wood. The cocktail table was found in Northern Thailand and made with small pieces of wood attached to form a circle. I love this free-form cocktail table with steel legs. It was purchased from an artisan workshop in Chiang Mai, Thailand. This is an "Isho-Dansu" clothing chest from the late Meiji Period (about 1890) in Japan. She found it outside of Kyoto. The English "Coffer Chest" with the date 1708 carved on the front, is used for storing blankets. A gorgeous carved teak bench is from Eastern Java and sourced in Bali. The modern, natural style side table made from Acacia wood was purchased outside Chiang Mai, Thailand. A meditating yogi rests on top. She has a creative way of displaying art and specimens from her crystal collection. 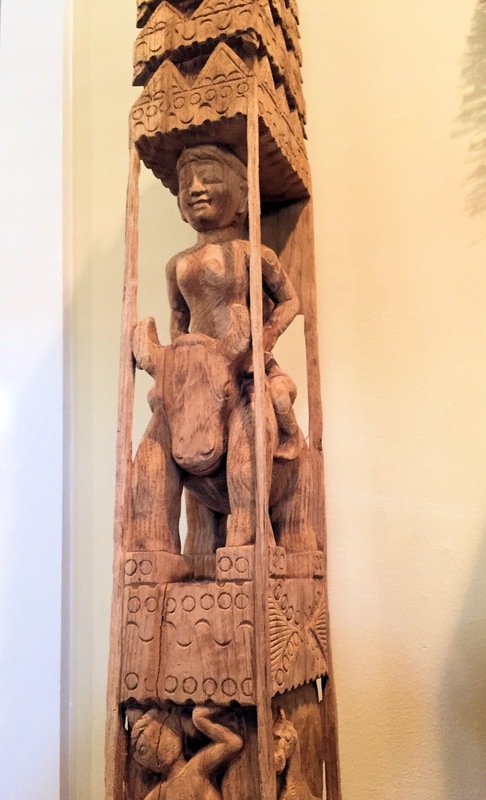 A favorite piece is this tall carved wood floor sculpture from an ethnic tribe in Burma (Myanmar). Intricate carvings on a vintage Chinese table. This large teak cabinet is made from old carvings, each with a wonderful patina. Fabulous pieces mixed together for dramatic effect include a 16th century Khmer bronze mirror from Laos or Cambodia and a Moroccan Berber stoneware inkwell from Essaouira. The specimens of clear optical quartz crystals were found at the Tucson Gem and Mineral Show. An ancient wooden oxcart wheel is repurposed as a modern sculpture. A beautiful cut-work wall plaque with a mother-of-pearl finish is from the Philippines. The custom table lamp displays crystal specimens on an acrylic base and sits on a reproduction Chinese demi-lune table. The large deep carved wall sculpture was made in Burma (Myanmar) and found in Northern Thailand. A vintage teak carved transom is from Java. Another great repurposing idea is shown with this sculpture made from an old sugarcane grinding wheel from Laos. The wall sculpture is a modern pierced metal variation of a lily pad. Found in a design workshop in Chiang Mai. An old Chinese table with a rattan top. She fell in love with the leather-covered teak plantation chair on her first trip to Bali. The rustic wood floor lamp was made by a workshop in Chiang Mai. She sourced the agate slabs in Tucson and made them into custom table lamps of her design. I hope you enjoyed my accessory meanderings.